So nothing really happened that last day. The posts were getting redundant and there was nothing to add. I figured I’d wait a week or two and see if I really noticed any differences going back to human food. So on our last day we made some veggie nachos for dinner, classic. We also went out and drank a bunch and had hot pretzels with cheese. I had a Bell’s Two Harted, it tasted so hoppy it was nearly undrinkable. The pretzel was some crappy pretzel that was probably warmed in a microwave, it was the best damn pretzel I’d ever had. This reminds me, Bar Louie is a terrible place that I hate and I never want to go there again. They were slow, the food was lame, the beer was slow, and the atmosphere is like being in a wedding photo album of someone you don’t know. I was fully confident my taste buds had been deprived and were now riding the MDMA train that was processed goodies. Upon this realization, I knew there would be no better time to eat a bunch of tacos as two in the morning, so we headed over to Tios and did that, and it was just as wonderful as you would expect. The next day was our Tết new year dinner (only a month and a half late, not bad). 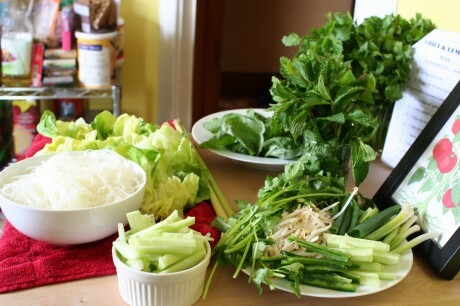 We made some lemongrass shrimp and our friends made some miraculously good phở bò, it was serious business. It started with oxtail and spareribs, cooked slow for a day or so in spices and broth, then finished off with some fresh greens and something approximating bulgogi. It was a fantastic showing. It may have been the best I’ve ever had. I ate way beyond the capacity of my stomach. So then I drank a bunch more and went about my business of being a normal human. Turns out everything seemed to be pretty normal. I overindulged because I hadn’t any non-lawn items to eat in some time so, yeah, I felt not great after that; but not worse than when I normally shove my face with delicious. Now I’m back to waking up later, drinking coffee, having the attention span of a dead goldfish…. but dammit I’m eating real food and that is a serious benefit. I stay up later and have a reason to live. The world is my oyster and I’m going to cover it in horseradish, hot sauce, and vodka and shoot it down my gullet. Check out Day 4 or do something better with your time.